Jonathan Cahn’s earth-shattering books The Harbinger and The Mystery of the Shemitah became New York Times bestsellers and brought him to international prominence. Known for unlocking the deep mysteries of Scripture and for teachings of prophetic import, Cahn leads Hope of the World Ministries, an international outreach of teaching, evangelism, and compassion projects for the needy. He also leads the Jerusalem Center/Beth Israel, a worship center made up of Jews, Gentiles, and people of all backgrounds, in Wayne, New Jersey. 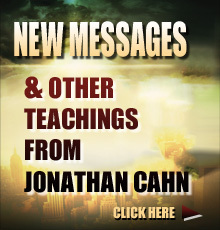 As a much-sought-after speaker, Cahn has been called the prophetic voice of our generation. He has spoken at the United Nations, on Capitol Hill, and to millions around the world. Jonathan Cahn is known for bringing out the deep mysteries and rich revelations of God’s word, as well as restoring the originally biblically Jewish context and flavor of the New Testament. He leads Hope of the World, an outreach dedicated to spreading the word of God and the love of God to all who need, through television, radio, shortwave, and more, and through projects of compassion to the world’s poorest. Jonathan also leads the Jerusalem Center (& Beth Israel) a worship center made up of Jew and Gentile, people of all nations – located in Wayne, New Jersey, outside New York City. Hope of the World is an end-time ministry of Jew & Gentile committed to spreading the Gospel of salvation, His word, and His love to every tribe and tongue, fulfilling the biblical mandate of the Great Commission to the Jew, to the Gentile, to all unreached nations and peoples of the earth. It does this through broadcasting the Gospel worldwide, via short-wave and AM radio, broadcasting to an area spanning the major continents, also through the free distribution of Bibles overseas to those who have not. Hope of the World also ministers to strengthen believers in the richness and power of the Gospel through audio, DVDS, and printed media. The love of God is also spread through special ministries and missions of compassion to the poor and needy of the world, food to the hungry, medical supplies to the sick, the building of bamboo churches, water wells, the caring for orphans... All gifts, donations, and proceeds go to the Great Commission of spreading God's love to the world. To contact us, for more information, audio lists and available resources, or to see how you can be a part of this end-time mission, visit us at www.hopeoftheworld.org. The Jerusalem Center is one of the largest Messianic Worship centers in the world, a worship center made up of Jew and Gentile, and restoring the original Jewish roots of the Gospel from the Book of Acts. The Jerusalem Center is made up of people of all nations, backgrounds, and denominations – and is located in Wayne, New Jersey, outside of New York City - CLICK HERE for the Jerusalem Center website.